We love a good manicure as much as the next girl, but it sure costs a pretty penny. Although it’s a treat to have one done at a nail bar, there’s no need to spend a small fortune when you can easily do it yourself. Imagine what you could do (buy) with that R200 to R400 you’re spending every few weeks? Here’s a few tips to help you treat yourself to the perfect DIY hand and nail treatment from the comfort of your home. Time for a fresh start and perfectly primped nails! Use a non-acetone nail polish remover like Cutex Nail Polish Remover, R21,95, to remove old polish. Tip: If you often struggle to remove your nail polish, try using a piece of stocking. It’s a savvy trick to save your cotton balls and the environment – and because the material doesn’t soak up the remover quite as quickly as cotton, you use less product. Finally some good use for those stockings you wore once and ripped into oblivion! Choose your desired length and trim with nail scissors if necessary. 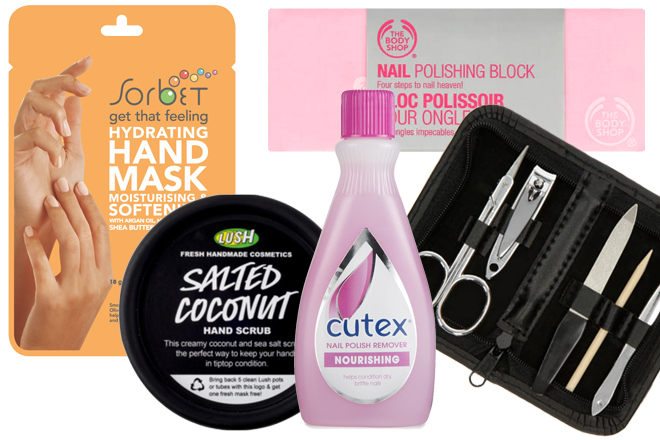 The Clicks Mini Manicure Set, R78,95 has everything you need and you can carry it with you for touch-ups. File your nails in one direction from the edges of the nail towards the middle to create your desired shape. Squoval (half square, half oval) is my personal preference. Soak your nails in warm, soapy water for a few minutes. This will soften the cuticles, making them easier to push back. Dry thoroughly. Apply a cuticle oil or lotion to assist while pushing your cuticles back. Trim any hangnails (pieces of torn skin at the root of the fingernail) with cuticle nippers. Be careful not to cut your cuticles because they protect against infection. The word “manicure” is derived from the French word, ”manucure”, which means care of the hands. So there’s more to a mani than a neat file and a pop of colour. Exfoliate your hands, wrists and forearms (up to your elbows) with a scrub. You’ll love Lush Salted Coconut Hand Scrub containing argan oil, R160. Think creamy goodness with a delicious coconut scent! The added argan oil is a great treat for your cuticles too. Use a nailbrush to scrub your nails, especially underneath. Dry thoroughly. The key to a great hand treatment is moisture and TLC. For some added care, try the Sorbet Hand Mask, R53. It helps hydrate your hands, moisturises your skin and softens while you sit back and relax. The glove is dry on the outside, so you can still use your hands – but you don’t have to admit that to anybody. This is much needed “Me Time”, after all. You can either buff your nails or get straight to the paint job. If you choose to buff them, you’ll need a nail polishing block. The Body Shop has one for R75. Buffing certainly has its benefits, such as stimulating blood circulation in the nail bed, which gives them a healthy natural colour and shine. So it’s pretty good to do it and it’ll add to that salon feel. Always apply a base coat. Although the base coat is transparent, don’t cheat yourself out of it because it protects your nails from discolouration. The Rimmel Nail Nurse Base & Top Coat, R59, plays double duty and can be used in the final step as a top coat as well. It also strengthens your nail and makes it feel smoother and shiny. How’s that for a time and money saver! While you wait (a minimum of two minutes between each coat), choose your favourite hue. 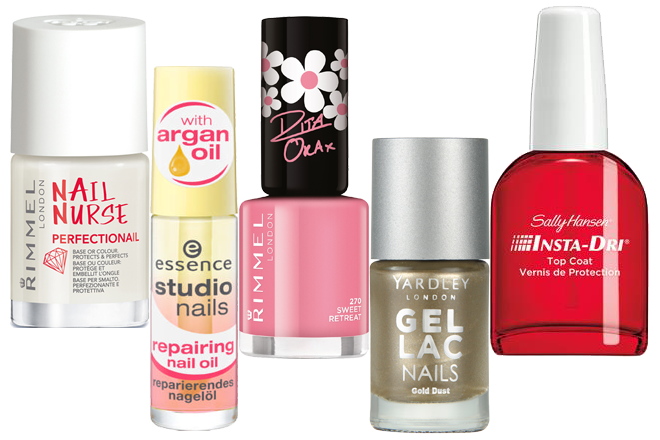 We love experimenting with new colours, but be sure to protect your nails. If your nails are damaged or you want to treat your nails, try the Essence Studio Nails Repairing Nail Oil, R44,95. It helps restore a healthy nail surface, and the argan oil deeply cares for and softens your cuticles. Choose your favourite nail polish or stay on trend with Essie’s new autumn collection. If you want to feel glam, try one of the pretty paints in the Rita Ora range by Rimmel, R59,95. It dries quickly and provides an ultra shiny pop of colour. Now to get painting! On each hand, start with your thumb and move on to your pinkie, following on to the other three nails. This will help you to focus and boost your precision while applying. Try to get maximum coverage without painting your skin. Make sure to apply thin coats to speed up drying and avoid smudging. Apply two coats to enjoy the full effect of the colour. This is a clear, glossy polish that protects against nicks and chips and makes the colour last longer too. Always smudging and chipping? Try the Sally Hansen Insta-Dri Chip Resistant Top Coat, R89,95. It dries in 60 seconds and works to harden your nails, protect your colour and resist chips. If you haven’t perfected the art of application quite like your beauty therapist, no pressure. Take your time and simply clean up the edges with a cotton bud. Even the pros slip up from time to time, so don’t be disheartened. Remember, practice makes perfect. Tip: Take a few minutes to touch up your manicure every other day with a single layer of top coat. Enjoy a “fresh from the salon” appearance for longer. Keeping your hands and the nail area healthy-looking requires moisturiser. You can’t have great nails and hands without this essential product. 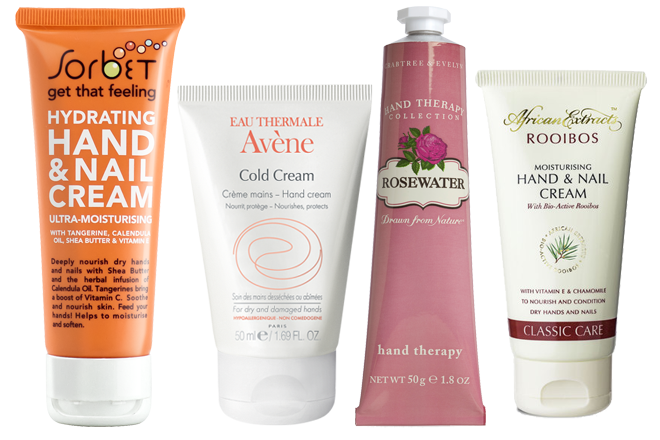 If you’re all about the investment piece, try the Crabtree & Evelyn Hand Therapy, from R120. The formula locks in moisture and contains hydrating ceramides and oils to condition nails and cuticles, along with a delicate rosewater fragrance. Sorbet Hydrating Hand & Nail Cream, R33, is a great moisturising lotion, and it’ll give you that ‘Sorbet feel’, at home. Pop it into your handbag and apply on the go. Suffer from dry skin? You’ll appreciate Avène Cold Cream, R99,95. I love the hypoallergenic formula that nourishes my sensitive skin and repairs it while protecting from further damage. The African Extracts Hand & Nail Cream, R54,99, includes natural ingredients to help nourish your skin. The new formula contains Bio-active rooibos with an added SPF15. It’s a decadent cream that’ll further nourish your skin and protect against sun damage. You’ve got this! If you have the tools lined up and you use the correct techniques, you can easily give yourself a beautiful manicure at home. The products will last for months to come and you can even treat your girls. Of course, there’s nothing wrong with getting a professional manicure done for special occasions or just to be pampered, but knowing how to do it yourself can save you a lot of time and money. Now go forth and treat yourself! Estimated cost of essentials used: R412! My favourite thing about this article is how detailed it is! I’m definitely going to try this out! I couldn’t possibly get it wrong. I will definitely use an exfoliator now. Is there a cream for wrinkling? Driving to work every day, my hands get quite sunburnt and a bit dry. Lush’s peace and love hand cream is also so amazing, it keeps my hands extremely moisturized. Especially in winter my hands get very dry. After reading this article, hopefully I won’t have to spend money in salons.. What a detailed article, thanks! I have wanted to try hand scrubs for so long! I really feel like it can improve the look of your hands and ultimately – your nails. Will definitely try doing my own hand spa and manicure in the future! Wow! This is so detailed and so helpful! I love looking for new ways to save me money but still get a professional look and feel. There are many steps and products that I wasn’t aware of, now I can go back and follow each step. I love the fact that this article has prices of all the products, this way there are no surprises and one can easily budget themselves! Extremely helpful! Definitely trying this out ASAP!